This reinforces my own understanding that the language of Scripture and the Church is full of metaphors. This allows us the freedom to plug in moments and events from our own lives, times and contexts into the stories and poetry of the Bible. For my own part, this freedom allows me to apply these metaphors to the way I game. Once again, I marvel at the genius of the early versions of RPGs — at how wide open and inviting they are to metaphors and applications of all kinds. I could play more modern games and apply Scriptural metaphors to them, but why go to all that effort when I can do the same thing with such ease when playing with older rulesets and the retro-clones that emulate them? At any rate, for those who are about to undertake that great journey known as Lent, good strength and good travels. Please note the archetypes that she has already picked up in her short life: warriors use swords, priests wear crosses and wizards have pointy hats and use wands. The only anomaly here is the paladin (which she called a 'holy warrior') and even he is an archetype. These types were not drilled into her by me being her father. I have not expressly exposed her only to the type of fantasy I like — I have freely allowed her to pursue her own interests. This passive exposure, however, was enough to solidify in her mind these classic tropes expressed by the core classes and races of 0e and 1e D&D. 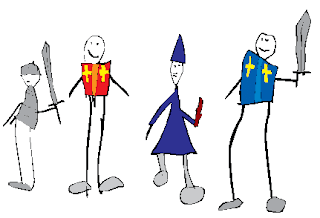 Thus, a basic, introductory version of D&D is best served by playing to these archetypes for the very reason that my daughter drew the party she did — they are at the core of what anyone might consider "fantasy." I saw Star Trek (2009) for the first time last night. This in and of itself demonstrates two things about me: 1) I have three young children and don't have the time or wherewithal to see movies in the movie theatre anymore 2) I found out a long time ago that being the first on my block to experience something "new" does not actually make the experience any better, it just usually costs more money. Therefore I am perfectly willing to wait until the DVD release (and take advantage of the pause button and subtitles). Right off the bat I must say that I enjoyed watching the movie. It is a nice action flick that did a good job of making me suspend my disbelief about a bunch of things that are impossible and/or make no rational sense, had enough of a plot to entertain for a couple hours and was filled with some well executed eye candy. However, I cannot by any stretch of the imagination say that I liked it. In fact not only do I like this movie less the more I contemplate it, the more disturbing I find it. I have spent much of my life studying history, both formally and privately. This is reflected in my long and steady participation in war gaming and rpgs. Although, as a Christian, there is much to criticize about Rodenberry's utopian vision of the future, I have to respect the loving manner in which this franchise has treated its own history. The best of all the Star Trek movies by a fair margin — Wrath of Khan — is an example of Star Trek paying homage to its own past. Star Trek (2009) attempts to move forward from this grand tradition by eradicating virtually everything that has occurred in the Star Trek universe over the last 4+ decades in order to re-boot the franchise. They splinter the time line in the first minutes of the movie and never repair the damage. Everything that we ever knew about Star Trek is gone. I disagree with those that say this is an "alternate timeline." The elder Spock came from the Star Trek universe we all know. In order for him to exist in this "alternate" version, the original had to be destroyed. There have been plenty of times that Star Trek has played with time, but has always managed to correct itself within the course of a movie or an episode. This movie, however, deliberately refused to do that. At the core of this particular decision is an attitude that says, "In order to move forward, we must (to a lesser or greater degree) eradicate the past." As an historian, I find this repugnant. My formal education concentrated upon those societies that lived through such an attitude at the socio-political level. The human damage is stomach wrenching and far-reaching. I know many who still have literal and emotional scars, including members of my own family. This got me to thinking about the OSR. One of the questions raised in the wake of D&D IV is: how far does a game need to remove itself from its past to stop being that game? To frame this question in terms of Star Trek (2009): has D&D IV tried to go forward by eradicating the past? One of the things that I truly love about the OSR is that it is steeped in history. Even when we take the hobby into uncharted territory, we lovingly acknowledge the roots of the game. We pay homage to what has come before. In my humble opinion, the result is a richer experience and a better game.